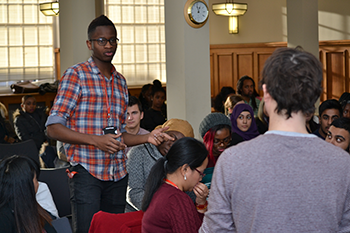 Business students from Middlesex learnt how to boost their CVs at an event organised by the Business School in conjunction with the University's Employability Service. Hendon Town Hall was packed with undergraduates keen to find out more from two guest speakers from The Challenge Network and Enterprise Rent-A-Car about the summer work experience opportunities on offer to students, as well as take advantage of a drop-in CV checking service. 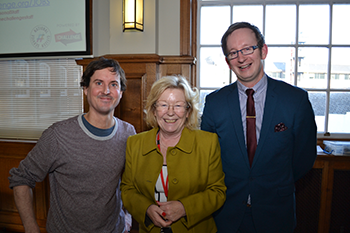 The day's first speaker was Staffing Associate Hugh Fossick (pictured above left with Elaine Elson and Graeme Butler) from The Challenge Network, the local National Citizen Service (NCS) provider in London, Surrey, the West Midlands and the North West. The NCS brings together 15 to 17-year-olds from all backgrounds to take part in outdoor activities and run community projects. For some of the youngsters, the activity week is the first time they've ever been to the countryside. In order to run the programme, The Challenge relies on students to take up paid "roles of responsibility" such as Programme Leader in charge of up to 84 young people and 12 staff, and Support Worker, which involves providing one-to-one assistance to those with disabilities or behavioural issues. "It's the best thing you can do with your summer," Hugh told the students. "You will learn a huge amount, including leadership and people management skills, and boost your personal and career development." 'Enthusiasm' is the key trait Hugh and his team are looking for, but those keen to apply will have their all-round skills tested during an applicant day. To get the Business School students on the right track, Hugh broke off from his presentation to ask the audience to split up into groups and prepare a community project proposal in ten minutes before presenting it to their peers. Employability Adviser Elaine Elson, who ran the event with help from Graduate Academic Assistants from the Business School, said she was delighted with the way the students responded to the task. "The students came up with some fantastic ideas in a short space of time and showed real confidence in presenting them," she said. "These are the kinds of skills the students applying for placement next summer will need to demonstrate." Talent Acquisition Specialist Graeme Butler from Enterprise Rent-A-Car also got the students into groups to discuss with their peers how they would handle an unsatisfied customer – something integral to running a £2 million local business with a fleet of 90 cars. In total, the firm has some 300 trainee manager roles covering internships/placement years and graduate jobs on offer. At Enterprise, interns work in one of the organisation's local offices, where they acquire highly marketable skills and gain experience in every aspect of operating a business – from fleet management and marketing to profit-and-loss analysis and sales techniques. And there are no menial tasks involved, with Enterprise interns expected to take on the same challenges as its first and second-year full-time professionals. Graeme was keen to stress to the students that in areas such as finance and banking, 43 and 71 per cent of graduate employees respectively have done work placements, showing the importance of bolstering your CV while at University, whether with Enterprise or another company. He also had plenty of practical advice to offer in the form of a 'How to ace the assessment centre' segment. If you'd like to learn more about the work placement opportunities on offer with the Business School, click here.